M-START is a professional software that includes all the aspects of human/system interaction of the industry 4.0. It is composed of a powerful human/machine interface creation tool that reduces the development time. The software also includes a client/server communication layer linking the users and the machines. 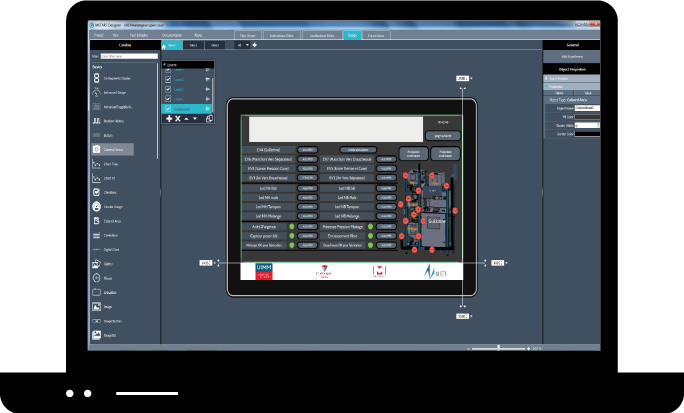 Very modular, you can create simple HMI or machine command-control. 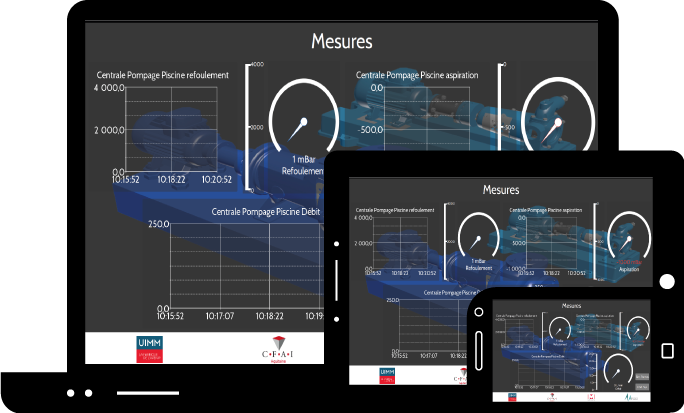 Design more complex application for telemetry, video systems, geolocalisation or connected objects applications. With M-START, there is no limit in HMI conception for supervision and command-control. Install M-START Server on a computer connected to your local network or in the cloud. 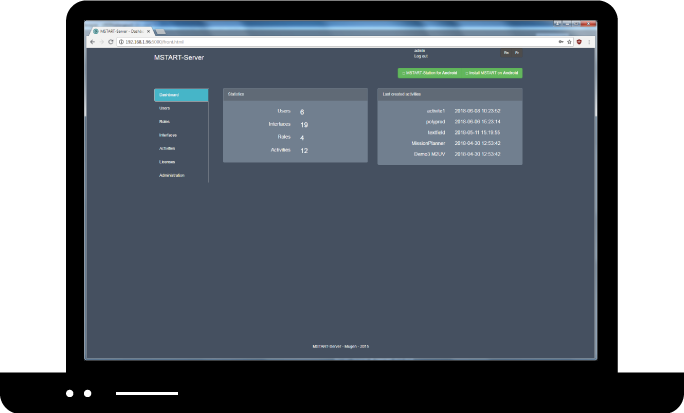 Design the pilot interface that you will then deploy on the server. Log in with a password, a PIN code or a QR code to access the HMI control. M-START Designer is the interface creation software of M-START. Including advanced functionality ( cartography without zoom limit, low latency streaming video feed reader, PDF reader, a web rendering engine,...) and combining interfaces elements with a neat design, you can create high-quality HMI for your product or machine. 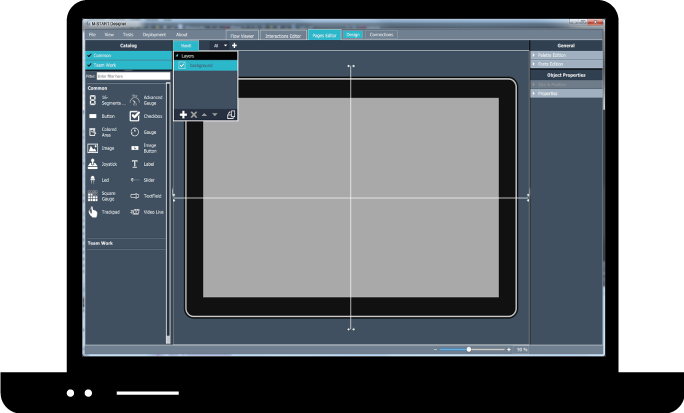 Easy to use, cut in half the design time of your interfaces with M-START Designer. M-START Station is the application showing the interfaces made with M-START Designer. Cross-platform, it is available on different devices (computer, smartphones, and tablets) and operating systems (Android, Linux, Mac OS, Windows). Light and fast, it allows you to real-time control the connected systems. M-START Server is the backbone of the solution M-START. It is a gate between users and machines that allow the fine-grained management of users and their privileges, control their associations between interfaces and machines and to collect machines operating data in order to realize analysis for advanced maintenance. Design to consume few resources, it can be deployed on computer or nanocomputers (Raspberry Pi).